One Post, Four Months of Updates. What’s up, sports fans? I don’t know if anyone actually follows along on these blog updates, but if you do I’m sorry for the long gap between posts. Needless to say I have been super busy with training, school, life, and vlogging and blanked about keeping my blog up to date. But here we go. The last time I posted was the beginning of September. To keep you from getting bored reading about the last 3 months of my life, I am going to do a recap of each month in 3 sentences each. Here we go. My team and I came home from Europe on September 1st after an awesome camp of competing in Summer Grand Prix. We did a lot of jumping, bike riding, and all raced in the Red Bull 400 in Park City, where USA Nordic had 5 athletes in the top 10! After having a nice mental break from travel and competition during a month at home, we headed back to Europe for our final camp of the summer. Our final camp of the summer essentially felt like 4 week-long camps in one; we spent a week jumping and training in Slovenia, a week in Ramsau, Austria skiing on a glacier (or what was supposed to be a glacier thanks to good ol’ climate change), then we went to Croatia for a week, and finally spent a week in Germany training on the ice track in Oberstdorf, GER. This was a really tough camp for me both physically and mentally, and I really struggled to keep up my normal positive attitude in the last few days of our trip. This was really tough for me also because it made me feel like I was not where I needed to be this close to the start of the real competition season. I used November as a month of reassurance that everything that I had done throughout the summer was worth it. I dug myself out of the hole that I was in during October and had really strong intervals, a strong race in West Yellowstone, MT, and then boosted my mentality back to above normal. I went from questioning my life in October to being to excited to compete again all in the span of three weeks! And thats how we made it to December! It’s only the 4th day of the month but its already been an eventful December. The first weekend of the month was spent in Steamboat Springs, CO for Winterstart, the first competitions of the year for both ski jumping and Nordic combined. I’m happy to say it went well! I was able to keep my head in a happy place and jump and race really well. 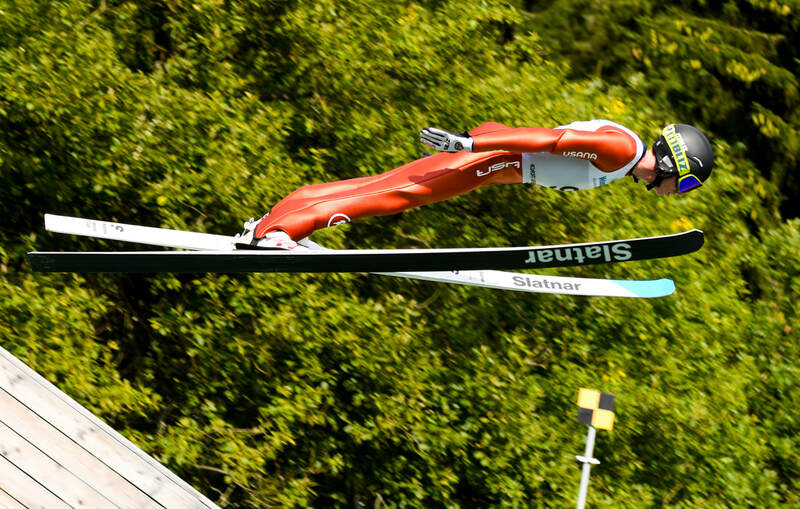 I took the win in the Nordic combined race and finished 2nd in the Ski Jumping competition as well. Needless to say this got me excited for the rest of the winter! I’ll be traveling home for about a week and then headed right back to Steamboat to kick of the Continental Cup season. I promise I’ll be a little more timely in my posts for that event. Stay tuned! There is a common idea that the world's best athletes train and focus on their sport 24 hours a day, 7 days a week, 52 weeks a year. Yes, it takes an immense amount of focus and drive to be a professional athlete, but the idea of training 24-7 is incredibly misleading. With anything you do, if you don't give yourself a break you will burn out. This is no different for professional sports. Don't get me wrong, becoming a world class athlete takes years of commitment and dedication to your chosen sport, but with as much training as it takes, it also takes a large amount of rest to get the most out of the training that you do. For myself, the training season essentially spans from April to March, with usually a 2-3 week break in between seasons. That means that outside of the 2-3 week break in the spring, Nordic combined dominates my time for the rest of the year. With the exception of the occasional-to-frequent afternoons off and typical-to-expected Sundays off from organized training, we pretty much train twice a day, most days. While my team does a good job of keep training interesting (usually by going for cool workouts, keeping each other entertained, and making sure that we don't get too repetitive), I still find it hard sometimes to keep myself from getting mentally/physically drained throughout the year. This season, I have made rest and recovery a higher priority than I have in the past. Admittedly, I have done a terrible job of resting in the past. Last summer, for example, I took courses at the University of Utah, worked full time as a zip line/ropes course guide, and trained full time as an athlete which was wayyyy too much to put on myself. I was pretty cooked at the end of every day, and it took realizing how awful I felt to make myself change. So, this summer, I worked less, only took one class online, and prioritized spending my off days off. ​ Off days are super important when you spend as much time training as my team does. Not only is it a physical break, it is also a mental break. Having a day, or even just an afternoon, to not think about what your next training session is, if you’ve eaten enough food to make it through the session, if your equipment is dialed for the day, or making sure you have enough sunscreen is a much needed mental break that doesn’t seem like much, but is so, so important. In the past, on off days/afternoons I used to pick up shifts at work. I figured I wasn’t missing training so I might as well make some money. This year, I’ve prioritized not making that mistake. Instead of sitting in the 100 degree sun for 8 hours, I have been sitting on my couch or in my bed, away from the sun and the tiring heat. It is weird to spend so much more of my time trying to take it easy, but it has been much needed and I have been able to tell a difference in my overall energy level. Taking it easy has given me time to do other things with my time. I have more time to work on my online college courses. I am also trying to teach myself German which has not been easy. Overall, making taking it easy a priority has boosted my energy levels and lowered my stress levels, which has understandably made me much more happy and productive. I can’t wait to see how the extra rest in the summer pays off in the winter! The last week of July is possibly the busiest week of the summer for myself and my team. This week was the Springer Tournee and US National Championships in Park City, UT. This week brings essentially every ski jumping and Nordic combined in the US together for a week of training and competitions. It may be one of the busiest weeks of the year, but it is also one of the most exciting as well. On Tuesday of Springer Week, the Park City Ski and Snowboard Club organizes a "National Team Mentor Day" in which each athlete on the National Team is assigned a group of kids to coach for the day. In the morning we run through a standard field testing session and then in the afternoon we coach the same group of kids on the ski jump. This year was my first time being one of the National Team mentors and I had a blast coaching kids from all over the country! On Wednesday, USA Nordic held it's annual Summer Soiree Fundraiser. This is event is a huge fundraiser for our organization and brings in lots of money to fund our teams, as well as gives us athletes a chance to meet some of the people in the community who support us throughout the year. I was stoked to take part and meet some new and old friends at the fundraiser as well as help USA Nordic raise some money! While Tuesday's mentoring day and Wednesday's fundraiser are fun events to be a part of, the main focus of the week is competing. On Friday, we competed in the Springer Tournee Competition on the k90. This event was a great way to prepare for the weekend's National Championship competitions without having as much pressure on your shoulders. 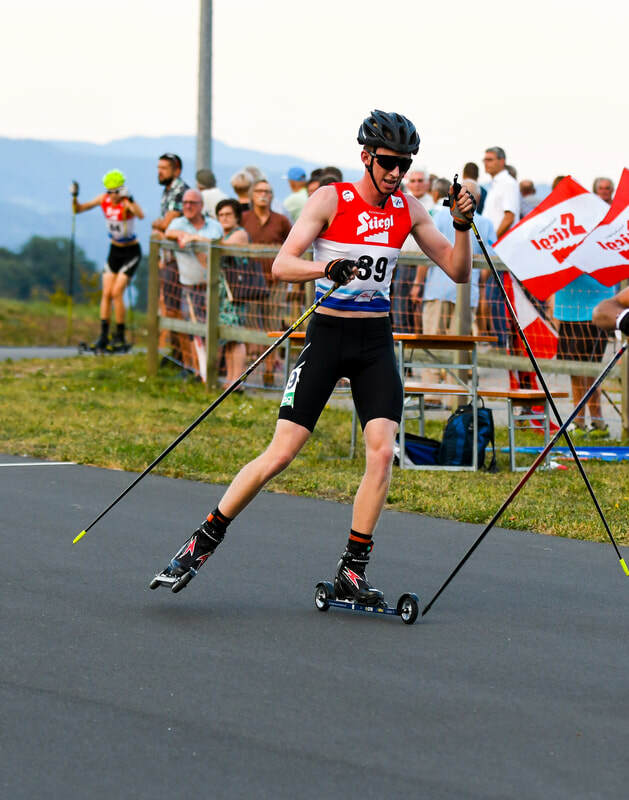 I competed in the junior class (under 20 years old) and was able to walk away with 4th place, behind 3 really promising men's junior national team ski jumpers. Any time a Nordic combiner, like myself, is able to be in the fight for the podium with the special jumpers, I consider it a good day! ​​​​Saturday morning marked the first day of ski jumping National Championships and the only day of Nordic combined National Championships, both held on the k90. Like the day before, I jumped to 4th place in the Nordic combined class and would start the race 42 seconds behind the leader, Ben Loomis. Unfortunately I wasn't feeling it on the cross country course and struggled my way through the 10k race at Soldier Hollow, but was unable to move up any spots and finished the race in 4th. I wasn't happy with the way I raced, but 4th place at US National Championships was my best finish to date! On Sunday, we competed in HS134 National Championships, this time for just ski jumping. I can't say that I was feeling too great after the race on Saturday, so I knew that this day of jumping would be kind of rough. As I expected, my 3 jumps for the day were not fun. But, it happens. Thats part of the sport so while I can be disappointed for the day it doesn't mean that I need to let one bad day of jumping impact my progress that has been made on the hill. And that's how the week went! We are at home for another week and then will head to Minneapolis to do some more work with the Mayo Clinic, USA Nordic's awesome Medical Partner. Stay tuned! Another year, another 4th of July spent in Steamboat Springs, Colorado for the " 4th of July Jumpin' and Jammin' festival". For the past 6 or 7 years I have been making the trip out to Steamboat Springs for this week of ski jumping and cross country skiing, however this year my team decided to make the camp a little bit longer than usual. We headed to Steamboat on June 28th and stayed all the way through July 7th for a full 10 days of training and fun. Perhaps the most important part of this camp is our annual time trial (TT) up to Fish Creek Falls. We do this TT every year during the 4th of July week and it is a great way to measure progress as well as compare yourself to the other athletes in the field. For some of the younger skiers, it is a great way to see how you compare to the athletes on the National Team. Up until this year, I had been one of those younger athletes comparing myself to the team. However, this year I became one of the athletes that younger kids compare themselves to, and I had a blast seeing all the juniors crush it. Ever since I started doing the TT, we started at 8am. This year, due to traffic concerns, we started bright and early at 7:15am. Although it sucked to wake up at 5:55 to get ready for a roller ski race, it was super nice being done and home by 8:15. I stayed at my teammate Jasper Good's house for the week. He lives in downtown Steamboat so we just skied directly from his house which was super convenient. We skied our way to the start of the race and met up with all the other athletes doing the race, 23 in total. We structure the start so that the younger kids go in pairs every 30 seconds, and then the older athletes go individually at the end. I started 4 athletes from the back, meaning that I had most of the kids in front of me. I started at what seemed like a super reasonable pace and began to make up time on the guys in front of me. By the hardest part of the race, what we call the Wall (A super steep section of road), I had worked my way to the very front of the field. Luckily I have done this time trial enough to know the top part of the course and could know when the right time to go full gas was. I stayed in front of the crew and crossed the finish line in 24:39, which was a new personal best by almost 3 minutes! I was honestly shocked at my performance when I crossed the line, because 3 minutes is a huge chunk of time to take off in just one year. Hopefully thats a good sign for the season to come (knock on wood)! Taylor Fletcher had the fastest time of the day, and Ben Loomis crushed it to take second, followed by Jasper Good who was a few in front of me. Stephen Schumann finished a little bit behind me to round out 5 people in under 25 minutes! The Fish Creek Time trial is what I put the most focus on during this week, however we also had a jumping competition and a fun roller ski race on main street before the 4th of July Parade. I didn't have the best jumps during the competition, but due to the short length of the race and the different points calculation, I was slated to start the race 18 seconds behind the leader, Taylor Fletcher. The race is only 3km and lasts less than 8 minutes. I slowly worked my way to catch Jasper Good in 3rd place going in to the last corner, but unfortunately I slipped out on the last corner and slid to the pavement. I'm bummed I couldn't put in a fight for the podium but I'm happy to walk away with nothing other than some road rash! After the roller ski race on the 4th of July, the Steamboat Springs Winter Sports Club puts on an elimination competition. This competition is structured differently than normal. There are no style points and no judges. All the athletes jump as far as they can without falling, and the farthest jumpers advance through the rounds until finally, in a round of 8, the farthest jump wins. Going into the event I was already pretty tired, and after making it through the first round with a 68 meter jump (K-Point is 68m), I was unable to make it through the next round with a jump of 69 meters. All the juniors stepped it up and threw down some long jumps which I was psyched to see! The winner of the day was Decker Dean, who walked away with a cool $2,000 prize. After the 4th of July Festivities, my team and I got the opportunity to go wakesurfing on July 5th with a local company called Wake Steamboat. They brought 8 of us out on their boat and taught us how to wake surf. Myself and Taylor Fletcher were the only two who had previously wake surfed, but everyone else picked it up really easily which was both surprising and awesome! This was a great way to spend our off-day after a couple busy and tiring days. We finished off the week with a final jumping session, followed by some strength and technique sessions in the gym. Overall I was super happy with how the week went, but I am happy to be at home now for a few weeks. Thank you to the Steamboat Springs Winter Sports Club and USA Nordic for an awesome training camp! Even without going to Europe yet this summer, it has been a busy season of traveling already! 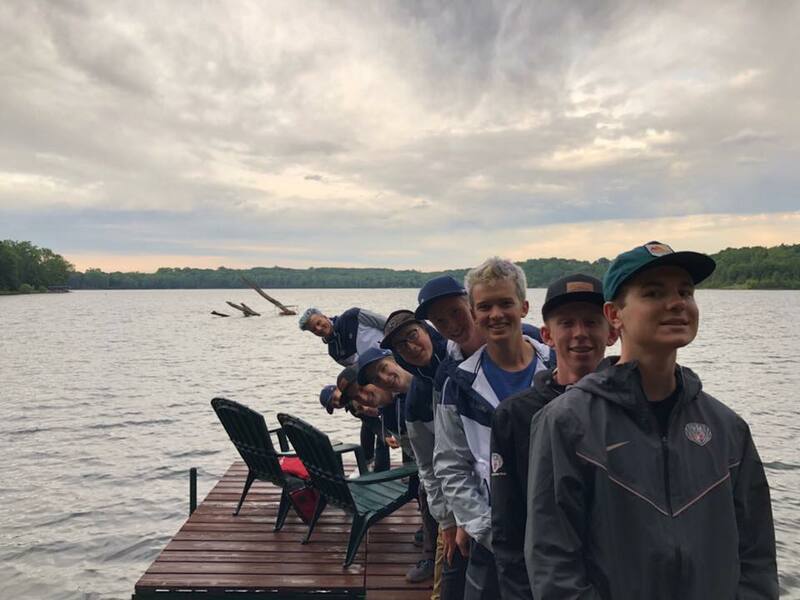 We started out with an all-team trip to Minnesota to work with one of our new sponsors, the Mayo Clinic, followed by a ski jumping camp in Coleraine, MN. After a quick 10 days at home, we headed out to Steamboat Springs, CO for our annual training camp and 4th of July competition. Its been a hectic but productive few weeks to say the least! Starting this season, USA Nordic and the Mayo Clinic entered into a 5-year partnership which we are all psyched about! 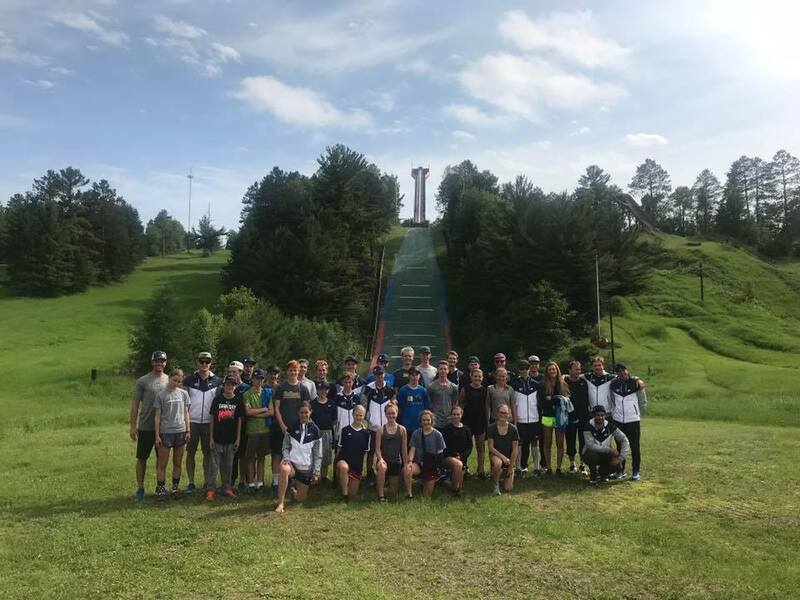 We started off this partnership by bringing all the athletes from both ski jumping and Nordic combined national and junior national teams (about 40 athletes) to Minneapolis to do all sorts of tests. We did lots of blood tests, a concussion baseline test, an ECG, a bone density/ body composition scan, a nutrition consultation, some physical testing, and finished with a VO2 max test. All of the information that we got from these tests will be super beneficial for us athletes and our coaches to know what our bodies are doing and keep track of changes over time! The national teams will head back to Mayo Clinic in early August and I'm already looking forward to being back! After our time in Minneapolis at the Mayo Clinic, we drove north to Coleraine, Minnesota for a 4-day jumping camp with all of the teams still together. These were our first jumps of the year. It is always exciting to jump again but at the same time it can be frustrating as well. After being off of the jump for almost 3 months, I struggled a little bit to get back to having jumps that I was happy with, but by the end of the camp it definitely felt like I had made a little bit of progress. This was my first time to northern Minnesota, and although I had heard stories of the bugs and the weather, I wasn't quite sure what to expect. But the stories did not disappoint. On our second jump session of the camp, we were able to take 2 jumps before the rain came in. Even though we water the hill in the summer for jumping, it was such a torrential downpour that there was too much water in the track for us to jump. One of the local jumpers hydroplaned down the track and at that point, every coach of every team decided to call it a day, understandably. In addition to the weather, every athlete ended up with countless mosquito bites up and down there legs. Being from Utah, the 2nd driest state in the US, I can honestly say I was not a fan of the rain and mosquitos that we experienced while in Coleraine. This training camp was much more relaxed than our typical Nordic combined training camp. Compared to the typical camp of lots of jumping mixed with lots of hard cross country training, this camp felt much more laid back. We did a lot of group activities together since this is one of very few times that all of the USA Nordic national and junior national teams were together. We had a lake day at one of the coaches' family camp near Duluth, MN and went to dinner at coach Blake Hughes' mom's house. It was cool to get to hang out with all of the juniors since we unfortunately have very limited interaction with most of them. All-in-all I had a super fun time, and can't wait to go back on another all team trip! After Coleraine, we travelled home to Park City for about 10 days. Our coaches wanted us to not jump when we were at home so that we could focus on jumping technique in the gym and do one last week of cross country training without the added time and pressure of ski jumping. Two of our coaches flew back over from Europe and then we headed out to Steamboat for our annual training camp and competition week. More on that next time! ​ It's been a pretty exciting and fun few days of life this past weekend! 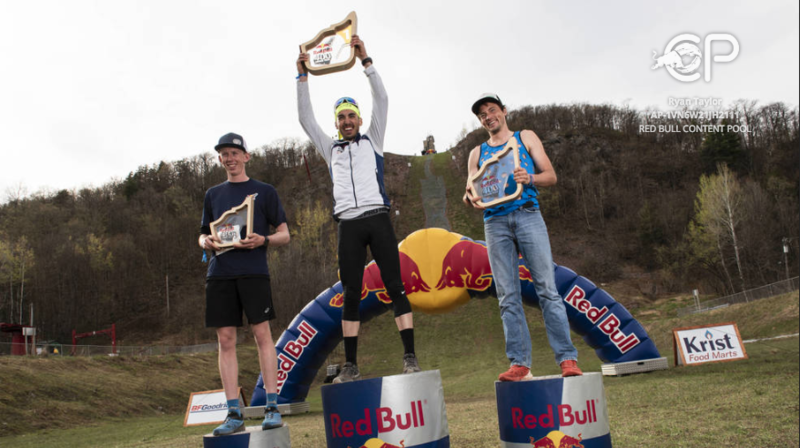 Last weekend I , along with my teammate Kevin Bickner, got the chance to travel to Copper Peak, MI to run a Red Bull 400 race, which turned out to be a really really awesome time. Then, directly from Copper Peak, I flew out to Bend, Oregon to meet up with the rest of my Nordic combined teammates for a two week training camp. This week definitely put me fully back into athlete-mode! Kevin and I got the opportunity to do the Red Bull 400 race at Copper Peak thanks to the support of Red Bull and USA Nordic. Copper Peak is what I would call a "dormant" ski flying hill. I say this because it could be a functional ski jump with financial and community support, however before last weekend the last competition on the hill was in 1994. The Michigan and USA Nordic communities want to revive this hill to have a functional ski flying hill within the US. USA Nordic and Red Bull flew Kevin and I out there to essentially be athlete representatives of ski jumping and Nordic combined with in the US, and I could not be more grateful for the opportunity! I had previously ran and won the Red Bull 400 race in Park City last September. The race starts at the bottom of the ski jump and you run 400 meters directly up to the top of the hill. 400 meters sounds quick, however my winning time in Park City was 4:25, which is more than 4x slower than a flat 400m race. Due to the success there, they thought it was a good idea to bring me out to Copper Peak. Compared to the last time I raced a Red Bull 400, I was not nearly as in shape. Last September I was in the middle of the high intensity training that we do to get ready for the winter competition season, so I was feeling really fit and strong. This time I was only three weeks into the training year and had taken lots of time to take it easy and live life outside of training, so I was not thinking that I was in the shape that I needed to be in to succeed in the race. Kevin and I flew into northern Wisconsin on Friday afternoon and drove up to Ironwood, MI where the race and hill are located. After having dinner with some really awesome media representatives from Red Bull and other publications, it was time to focus on Saturday's race. Luckily, Red Bull was a super generous host to Kevin and I, so we got to hang out in the Red Bull athlete trailer and really take it easy all day before the race. I was in the 13th of 18 qualifying heats, meaning that I got to see the bulk of the field run before I had to. There were a few guys far ahead of the rest of the field, so I knew that if I could just have a solid qualifying race I could be in the hunt in the final heat (the top 25 qualifier times get to race in the final heat). When the starting gun went off in my heat, I put my head down and just ran like I did the last time. To my surprise, I turned around about half way up and was completely alone. So, from there to the top, I walked and took it easy to save my energy from the final. I qualified in 3rd which I was more than stoked about. For the final heat, I felt a little bit more pressure to do well than I had in the past. Lots of the people that I had met that day were rooting for me and I felt like I had to do well to make them happy and proud, a feeling that I don't have too much. I like to race for myself, not others, because when I feel the need to impress others I am more easily disappointed in the results. However, I still knew that I could have fun with it even with that extra sense of pressure. In the starting area, I chatted with some of the other racers and had some laughs before the gun went off. I worked my way to the front of the pack of 25 so that I wouldn't get stuck behind anyone. I managed to make it about 200 meters up in the front of the group, and then Ian Torchia, a cross country skier on the US National team blew by me. I knew he was a badass athlete regardless, and the fact that he won the qualification by 30 seconds meant that he was the main contender for the win. When he passed me, I didn't have it in me to stay with him and I had to watch him rip up the jump to the top. Behind him, a rad dude named Matt passed as well, however I stuck behind him for another 100 meters or so before he dropped me. I made it to about 350 meters, turned around, saw no one too close , and made it to the finish in 3rd. It's hard not to be stoked on 3rd at such a popular event! I had a blast running the race and talking to Ian and Matt after the race. They are some serious athletes, and I was stoked to stand on the podium with them! Now, I am sitting in a hammock in Sunriver, Oregon after a large training week. I am a pretty wordy guy, so we'll talk about this training week next time! Well, my old cross country coach used to say that skiers are made in the summer, and he is absolutely right! Our new training year started a few weeks ago, and for this time of year we focus on doing lots of long, easy workouts. This is to build a "base" for the rest of the year. Essentially, we give ourselves a huge endurance platform that we can continue to build upon for the rest of the year. Also, we are not yet ski jumping at this time of year, so that makes it a lot easier to do lots and lots of biking, running, and hiking (and a little bit of roller skiing) without having to worry about being too tired to ski jump. This marks my first summer of being on the national team. That means that I have switched teams, switched coaches, switched training plans, and switched gyms, among other things. As you can guess, this is a pretty substantial transition, and one thing that has been nice has been having a group of people to train with. For last year, I didn't always have a training partner (mostly in the fall), and this year I've only done workouts by myself by choice. Having people to train with is one of the biggest motivators because it turns a 2-hour run or a 5-hour bike ride into a 5-hour conversation with your buddies. This may not sound like much, but it keeps me from getting into my own head and saying "why are you even doing this, Jared?". So, with my transition to the national team, one of the things I am most stoked about is being able to train with people all (or at least most) of the time. As we kick off the new year of training, I am also going to try to keep my blog more updated. I think that this will help me and anyone who actually reads this (honestly not sure if anyone does) keep track of how I am feeling throughout the year. When you train as much as Nordic combined athletes do, it is easy to overwork and burn yourself out. My hope is that by updating how the year goes on this website, I will be forced to think more in-depth about how I'm really feeling. If that interests you, please continue to check back! Start to the COC Season! ​This past weekend marked the first weekend of Continental Cup (COC) for the season and my first COC in almost 2 years! The COC circuit is one of the highest levels of Nordic combined competition in the world, and after this weekend it is easy to see why! This weekends competitions were all held in Steamboat Springs, Colorado and consisted each day of a ski jumping competition on the HS75 followed by a 10-kilometer cross country race, for three straight days of brutal competition. On Friday, we had more scheduled jumps than the other days. This is because before any FIS event, there is a requirement for official training rounds as well as a provisional competition round, or PCR (the PCR is used if we are unable to complete one of the ski jumping competition rounds later in the weekend). My jumps on Friday were not as good as I know I am capable of. I had issues with the timing of my jump as well as the direction in which I used my power. These issues combined put me into 39th place after the ski jumping competition, 1:49 seconds back for the start of the race. A few of my teammates had a much better day on the hill, including Ben Loomis who jumped to 2nd place just 6 seconds back! The cross country side of the sport has always been my strong suit, so I was feeling confident going into the race still. Friday’s race was a night race under the lights at Howelson Hill around a 2k loop. Friday’s race, along with the weekend’s races as well, had awesome crowds of spectators lining the hills and in the stadium making it a really fun environment to race in. As I said I started in 39th place. One of my Estonian buddies, Kail Piho, started right behind me and we were able to work together for most of the race. He and I traded off the lead for 4 of the 5 laps until I couldn't keep up with his killer pace. Throughout the entire race, we had coaches, friends, and wax-techs yelling our positions to us every lap. Each lap our rank progressively dropped… 39th, 37th, 33rd, 32nd. Going into the finishing corner, Jed Hinkley yelled as loud as he could “I think you’re 29th or 30th! !” Knowing that, I gave every ounce that I had to finish strong, not knowing whether I had met my goal and scored points, or been just behind. For about 30 minutes following the race, people were asking me how I had done. I kept saying “I think I was 30th”, to which people responded with pure stoke. 30th place in the Nordic combined world means that you score points, which are crucial for your overall ranking and qualification for other events. In the US Nordic combined world, a single COC point gets you a spot on the national team, a chance to compete at US Olympic trials, and a good chance of qualifying for the World Junior Championships, so not knowing if I had scored a point after the race was very stressful few minutes for me. It wasn’t until we were eating dinner and the results were uploaded. I had finished in 30th place and scored a point! That set my expectations high for the next two days of racing. Knowing that I was able to score points on Friday meant that I knew I was able to do it for the next races as well. Saturday was another below average ski jumping competition for me as well. I didn’t nail the timing and I jumped forward instead of up. I jumped to 41st place, but still only 1:58 back. I had one of the worst races of my last few seasons, so I was only able to ski up to 33rd place. Knowing that I didn’t have the race I wanted meant that I knew I could be close to points on an off day, which is encouraging for the future. For Sunday’s competition, I once again didn’t have the best jump, putting me in 38th place and again 1:56 seconds back. I jumped again near Kail Piho, who I had skied with on Friday and knew that I could keep up with on a good day. On the first couple laps, I felt good and knew that I was just a few places back from being in the points. Kail and I moved up quickly and were within striking distance of the group within the top-30. However, after 3 days straight of racing, I was completely gassed towards the end of the race. Frustratingly, I spent the last lap in 31st place, and was unable to bridge the gap into the top 30, finishing just 4.2 seconds back from scoring more points. I now can confidently say that 31st place is the worst in the world. This weekend’s COCs gave me confidence and knowledge for the rest of the season. I am confident in my ability to score points if I have a good jump. I now know that I can be one of the top-20 fastest skiers in a COC, which is a level that I have never been at before. I also am aware of the tiny mistakes that I made both on the hill and on the course that kept me from being in the points. For the rest of the season, I will be damn sure that I ski over the top of the hills, instead of giving up half way over and sacrificing seconds every lap. But I did meet one of my big goals for the season, which was to score COC points. I left a lot of room for improvement (29 places to be exact), but having the stress of scoring points lifted off of my shoulders will help me to be more relaxed in future competitions which will only help me to jump and race better! Now I am home in Park City to train before US Olympic Team Trials on December 30th. Stay tuned!